On Wednesday, December 9, the PFUN coalition delivered the “People’s Executive Order” ending all collaboration between police and ICE with a 48-hour deadline to sign it. We will rally on the north east corner of Philadelphia City Hall on Friday, December 11 at 11 am to see if Mayor Nutter supports his constituents or deportations. New Sanctuary Movement leader Estela handed the “People’s Executive Order” to Mayor Nutter’s representative at City Hall. The Executive Order No. 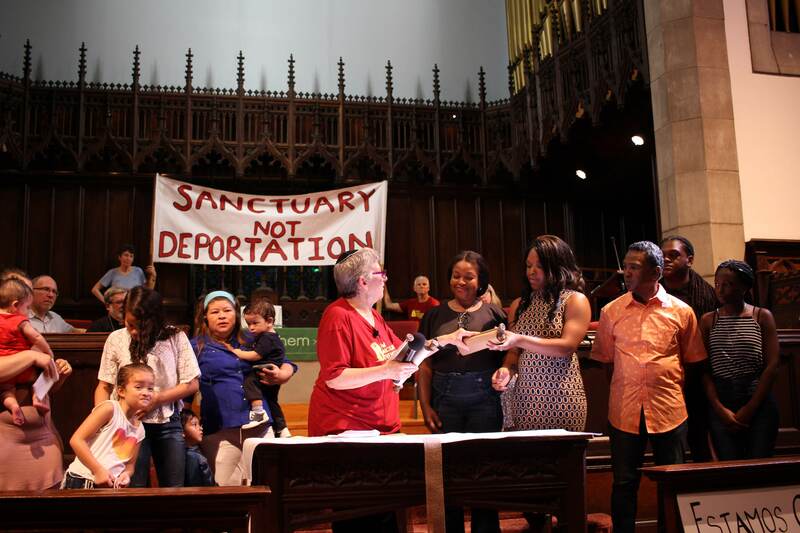 1-14, “Policy Regarding U.S. Immigration and Customs Enforcement Agency Detainer Requests,” enacted on April 16, 2014 established Philadelphia as a national leader in the fight against deportations and unjust family separation. This policy resulted in an increase in public safety, critical trust-building between immigrant communities and the City of Philadelphia, maintained family unity, and saved the City financial resources. No one should be stigmatized or shamed because they are not deemed to be “deserving” of justice and redemption by a system that our communities did not create. Cease active data sharing with ICE, including ending ICE access to the Preliminary Arraignment Reporting System (PARS) and rejecting participation in Priorities Enforcement Program (PEP). We call on Mayor Michael Nutter to fulfill his obligations by following the will of the people and signing The People’s Executive Order: Ending Collaboration Between Philadelphia Police and U.S. Customs and Enforcement.